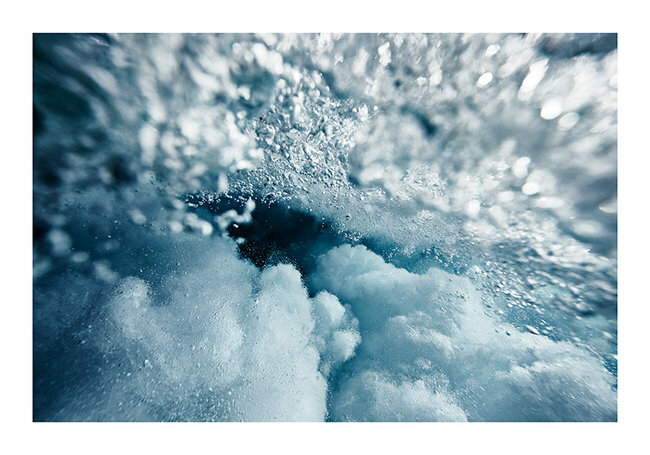 This photograph, captured by Chris DeLorenzo in deep wave territory off northern Malibu, California, is taken at the exact moment a wave has crashed down over his head — the photographer dons a wetsuit, fins, and a mask, and having developed a respectful accord with the ocean, is able to capture these turbulent moments in a meditative, wondrous, and energetic frame. Big, inconsistent waves crashed down atop the photographer the day this photo was taken, but the water, feeling cooperative, was still very clear. A portion of proceeds will benefit Mission Blue, which works to preserve and protect our earth’s oceans. This timeless underwater gem captures the depths and spirit of not only the endless wave, but a perspective below the blue sure to ignite your senses each day as you awake to your newest most prized work of art.